Building a prefab home doesn't have to involve picking from a dull catalogue of standard pads - check out this modern modular home in spain that is energy-efficient and zero waste. 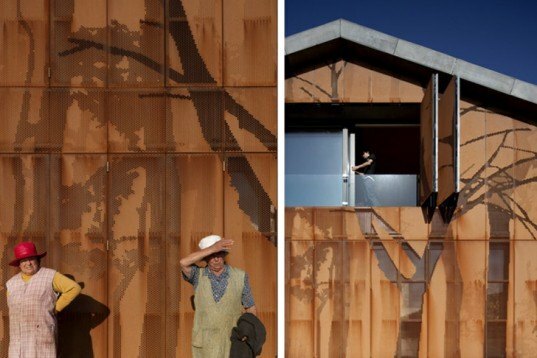 Casa Cedeira a prefab home that blends with its surroundings thanks to a forest motif on one of its walls. Designed by Madrid-based studio MYCC, this stunning eco-friendly woodland pad adapts to the needs of its inhabitants while maintaining a low environmental footprint. Measuring 525 square feet, Casa Cedeira is located within the eucalyptus forests of Galicia in northwest Spain. It is built from galvanized steel, which gives the house a gorgeous red shine as it gets rustier with time. Its pierced forest facade creates a fantastic woodland motif that brings nature inside. The home’s open floor plan and modular construction allowed its owners to customize the standard design themselves, adapting the pad to their needs and taste. Constructed from six standard modules, the multifunctional top floor room is made from bamboo and gets plenty of natural light from its windows, reducing energy use. In addition to the project’s galvanized steel shell, MYCC used non-toxic VIROC® – a material made from a mix of wood and cement. 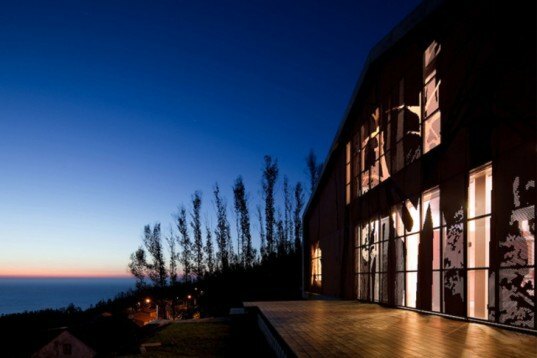 Even though prefab homes are not as popular in Spain (or even in Europe) as they are in the United States, Casa Cedeira sets a great example for others to follow. The end result is a high-quality, fixed-price, waste and energy-efficient shelter that was easily transported to its final destination. 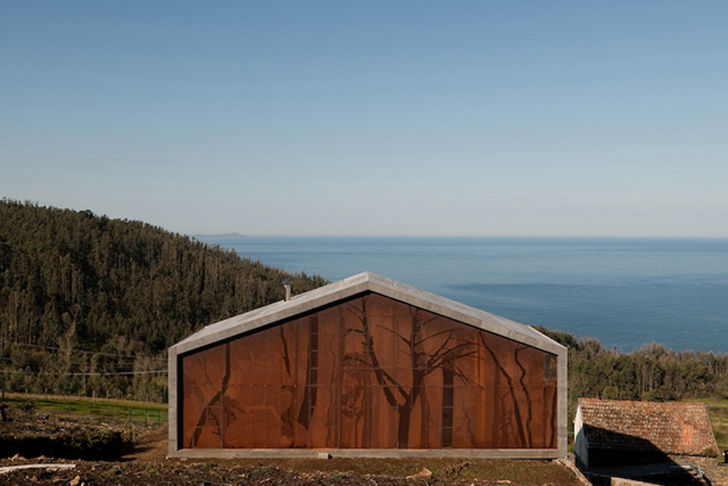 Measuring 525 square feet, Casa Cedeira is located within the eucalyptus forests of Galicia in northwest Spain. It is built from galvanized steel, which gives the house a gorgeous red shine as it gets rustier with time. Its pierced forest facade creates a fantastic woodland motif that brings nature inside. The home's open floor plan and modular construction allowed its owners to customize the standard design themselves, adapting the pad to their needs and taste. Constructed from six standard modules, the multifunctional top floor room is made from bamboo and gets plenty of natural light from its windows, reducing energy use. In addition to the project's galvanized steel shell, MYCC used non-toxic VIROC® - a material made from a mix of wood and cement. Even though prefab homes are not as popular in Spain (or even in Europe) as they are in the United States, Casa Cedeira sets a great example for others to follow. The end result is a high-quality, fixed-price, waste and energy-efficient shelter that was easily transported to its final destination.